The Fellows Update is a quarterly Sightlines feature that focuses on a Fellow, what he or she is doing today, and how to make contact. 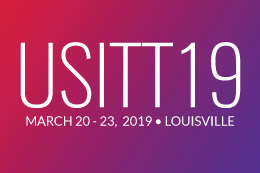 USITT Fellows provide an invaluable resource of experience and institutional memory that can be of service to any member. This month’s article is by Henry Tharp, USITT Fellow, educator, TD, designer, and props artisan. I was born in Winfield, KS, in 1932 and made my theatrical debut in 1936. Technically still only 3 years old, I appeared as a dancer just weeks before my 4th birthday. The one-room country school where I later attended first and second grades had done a production of Jack and the Beanstalk. The second act opened with a ballet called the “sprouting of the beans,” which consisted of three little preschoolers all crouched down on the floor, who, as the music played, gradually arose, stretched, and left out. I don’t really remember any of this but heard my Mother tell about it often. AND, I have the program and newspaper clipping to prove it! I attended Winfield city schools from grades three thru 12 graduating from WHS in 1950. 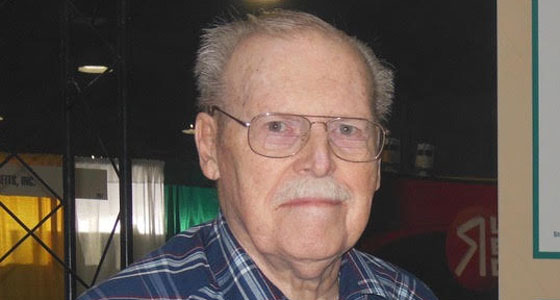 I started college at Emporia State that fall but didn’t graduate until 1958 due to a four-year intermission between my sophomore and junior years, which I spent in the USAF. I served as a navigator, bombardier, and radar operator during and after the Korean War. Next, I was off to the University of Illinois for my MA. I then spent the next academic year at Hofstra College as Don Swinney’s No. 1 assistant TD. Knowing the only way for me to advance was to move up into Don’s job and there was no way he would ever vacate it short of retiring, I decided to move on. In the fall of 1960 I started teaching at the University of Louisville where I was also the Designer/TD of the University Theatre. In the fall of 1962 I returned to Illinois to start on a PhD. After 2 years I had completed all but the dissertation (ABD) when the grant money ran out and I had to go back to work. Fortunately, my old job at Louisville was open, and I was rehired there. Two years later the Louisville Children’s Theatre got a grant to hire a designer/TD and lured me away from the University. After eight years with the children’s theatre the grant ran out and they could no longer afford me. So I wrote to a couple of old schoolmates explaining the situation, one of which was the department chair at Missouri. He called me to say he needed a designer/TD and for me to get over there for an interview. I did, was hired, and spent the next three years as an Assistant Professor. As an ABD I knew I was going to get caught in the tenure trap, which in those days was three years, up or out! As luck would have it, my shop supervisor was retiring due to inflexible University rules. The Department Chair asked me to write a job description for his replacement, which I did, one which only I could fill. It was approved all the way up the chain of command and all the way back down, advertised, I applied and, surprise, got the job. I then spent the last 20 years of my career running the scene/prop shop, maintaining the equipment, working with students, one on one, in their stagecraft labs, and generally having the best time ever doing theatre on a 40 hour week, and finally retiring in 1997! In 2014 my partner Bob and I move into Bishop Spenser Place, a very nice retirement community in midtown Kansas City, where we continue to enjoy life. Our apartment is large and comfortable with weekly maid service. The food is plentiful, excellent & varied. Both in-house restaurants are run by the premier restaurant company in KC. There is a lot to do — a full program of classes, films, lectures, recitals, trips out to any number of different places and events, etc. In addition, I still have my car and we go out for things on our own as well. I continue to volunteer at both the Folly and Starlight Theatres, as well as at the Midwest Genealogy Center — the largest public Genealogy library in the United States, although my trips out there (Independence) have become less frequent of late — there is just too much else to do closer to home. We took a trip on the Queen Mary 2 last summer to Norway round trip out of New York, which included a trip on Amtrak to and from NYC. Notice that there is no mention of an airline or an airport. We hope to never encounter either one ever again!